My first fall was not super eventful, but I remember it very clearly. I was 10, maybe 11, and was riding Duchess. Duchess was a rich red buckskin grade mare, and was pretty much a honey. 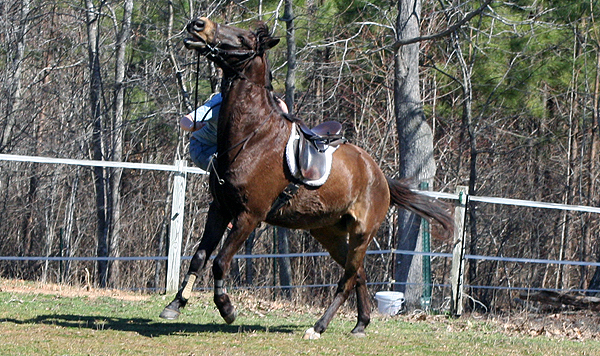 She was a well trained and gentle school horse though, and didn’t contribute to this fall at all. I was just learning to trot, and it was maybe my 6th or so lesson before I was allowed to move from walking, steering, and two point to some actual trotting. We were trotting tracking to the right down the hill towards the bottom of the ring, and since it was a hill she might have sped up a little bit? Either way, Duchess just kept on trotting and I kind of… fell off. Plop. I think I cried, but it didn’t hurt at all. I have always been a timid rider though, so it probably scared me just falling off. I did get back on and I think that I did more successful trotting the rest of my lesson. In a strange twist of events, here is me riding Duchess’ grandson many, many years later and falling off at almost exactly the same spot. Unlike my first fall, this one was due to him being very green/fresh/perhaps having a slight bucking problem and my tendency to lean forward at all times. Ah, memories.